For almost 40 years, the Brigham City Museum-Gallery has offered patrons diverse, quality programming such as the Norman Rockwell Lithographs, Oklahoma Memorial Quilts and Nagasaki Journey. The museum has also curated a variety of shows in-house that have had wide appeal, namely, Trail of Iron, a photo documentary about the construction of the first transcontinental railroad. The 3,300 square-foot museum has a rotating gallery and a history section. The gallery features about two national traveling shows a year and exhibits by Utah artists, while the history section showcases two rooms circa 1875 as well as artifacts from the museum's and the Daughters of the Utah Pioneers' extensive collections. There are also two interactive areas for families - Eliza's Attic and The Homestead, where young people have the opportunity to use pioneer tools. The museum, which is a department of Brigham City Corporation, is located at 24 North 300 West in Brigham City. Hours of operation are Tuesday through Friday from 11 a.m. to 6 p.m. and Saturday from 1 to 5 p.m. Admission is free. Built in 1890, the Heritage Theatre served for nearly 80 years as an LDS (Mormon) church. Now known as one of the best regional theatres in the area, the 220 seat theatre offers a wide array of quality productions year round. Housed in a 100 year old barn, community productions are performed in the round. See website for great dinner performance information. Box Elder County is the home of two world-famous land art pieces. The Spiral Jetty, built in 1970, is located off Rozel Point, in the Great Salt Lake, West, of the Golden Spike National Historic Site. It is 1,500 feet long and 15 feet wide. For some, the Spiral Jetty is just, a big piece of cement and rock shaped like a spiral sitting in the middle of some salt water in the middle of nowhere surrounded by a bunch of old junk. For others, the Jetty is a “Mecca” to which appreciators from around the globe visit and toasts its beauty, its artistry, and its importance. There are no gas stations and the last restrooms are at the Golden Spike National Historic Site. The road is extremely rough and a 4-wheel drive vehicle is recommended. Please observe the private property notices on route. Follow the signs at the Golden Spike National Historic Site heading west. 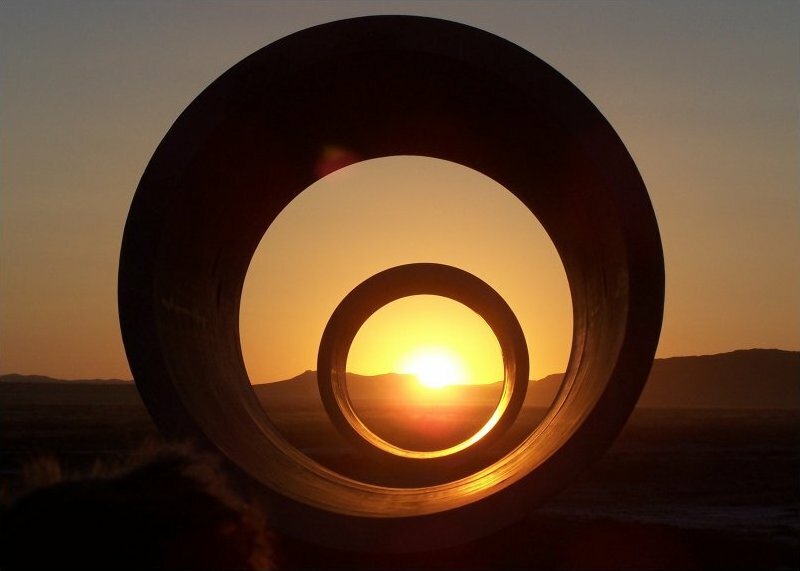 The Sun Tunnels, by Nancy Holt, are deliberately and strategically placed on the grounds of the ancient Lake Bonneville. The Sun Tunnels are a pleasant surprise in the middle of Western Box Elder County. Completed in 1976, the Sculpture consists of four concrete tunnels that are laid out on the desert floor in an open X configuration, 86 feet long on the diagonal. Each tunnel is 18 feet long and has an outside diameter of 9 feet, 2.5 inches and an inside diameter of 8 feet. The tunnels are aligned with each other and with the angles of the rising and setting of the sun on the days of the solstice, around June 21st and December 21st. On these days the sun is seen on the horizon centered through the tunnels. Get to Route 30 from either Interstate 84 (from Snowville, UT) or Route 223 (from Oasis, Nevada). Proceed on Route 30 to the Lucin cutoff (42 miles from Oasis, 83 miles from Snowville). Go south on the dirt road four miles to Lucin. Continue south from Lucin two and one half miles, and then bear left, going east. You should be able to see the Sun Tunnels pretty soon. Go another two miles, bear right, and go one and one half mile to Sun Tunnels.